This Year's 18-Can Mountain House Kit is Now Available! 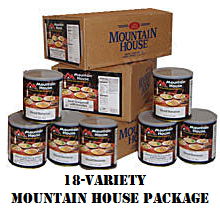 We're now offering a very limited number of 3-case variety packs of Mountain House foods. We do this just once a year and these kits get scooped up quickly, so move fast if you would like to add a quick, affordable dose of big variety to your larder. These kits consist of 18 #10 cans of some of the most popular Mountain House varieties ... 18 different varieties ... at a 10% discount! Order now and these 3-case kits will ship to you from our Safecastle warehouse the week of October 28. For more, see today's member email. If you are needing a kick in the pants to get through your current malaise and disillusionment with the sad state of affairs out there, then you NEED to read this entire communication on the Oath Keepers website. In a nutshell, the 30-thousand members of Oath Keepers are ramping up their action teams, based loosely on the U.S. Special Forces "A Team" model. Click on that link in the first paragraph here to learn more about what that means. 1. Intentionally trigger a catastrophic economic collapse as an economic “neutron bomb” (kills the people, but leaves the land intact). With the current intentional lack of a Strategic Grain Reserve, our population is in a strategic “checkmate” position where an economic collapse could be a near-extinction event for our population. During the Cold War, the U.S. government maintained three years worth of grain in a Strategic Grain Reserve for the entire US population because they knew that in the wake of a nuclear exchange with the Soviet Union, it could take three years to recover and grow crops again. Without that reserve, those who survived the exchange would starve to death before they could possibly restart growing enough food. We now have no such Strategic food reserve, which means that any catastrophic interruption in food delivery could kill millions of Americans. Such a disruption could occur because of even a limited nuclear exchange, an EMP strike (either man-made, or natural, as a result of solar activity), or, an economic collapse. Currently, our economy is in such a weak state that an economic collapse could be intentionally triggered at any time. Because of the lack of a food reserve, and because few Americans store food on their own, such a collapse would lead to mass starvation, just like in the aftermath of a nuclear exchange. We encourage each individual to build a food reserve, to set aside food for their neighbors (10% of their food is for others), and to have basic communications (at least a hand-held dual band radio), basic medical, and water purification, shelter, and weapons and ammo. We will post more details on our recommendations for preparedness in a follow-up post. Labels: How to be ready, Political realities, Why prepare?